A new report documents an increase in homicides in states with controversial Stand Your Ground laws and shows the disproportionate impact they have on African Americans. Many of the 22 states that have enacted "Stand Your Ground" self-defense laws -- like the one at the center of the controversy over last year's shooting death of unarmed Florida teen Trayvon Martin and the subsequent acquittal of shooter George Zimmerman -- have experienced a dramatic jump in the number of homicides, with African Americans disproportionately affected. That's the finding of a new report from the bipartisan Mayors Against Illegal Guns coalition in collaboration with the National Urban League and VoteVets. It was issued Sept. 16, the day before the Senate Judiciary Subcommittee on the Constitution, Civil Rights and Human Rights is scheduled to hold a hearing on the effect of such laws, which allow people to use deadly force in public places even if they can avoid the conflict by safely leaving the area. The report, titled "Shoot First: 'Stand Your Ground Laws and Their Effect on Violent Crime and the Criminal Justice System," found that states with such laws have seen their "justifiable homicide" rate rise by an average of 53 percent in five years following their passage. Over the same period, states without such laws saw justifiable homicides fall by an average of 5 percent. The increase was not simply the result of more homicides being classified as "justifiable" but of an overall rise in firearm-related and total homicides in Stand Your Ground states, the report found. The jump in homicides deemed justifiable was particularly dramatic in some states, especially in the South. The average annual number of such killings rose by 54 percent in Texas, 83 percent in Georgia, 200 percent in Florida, and an eye-popping 725 percent in Kentucky. 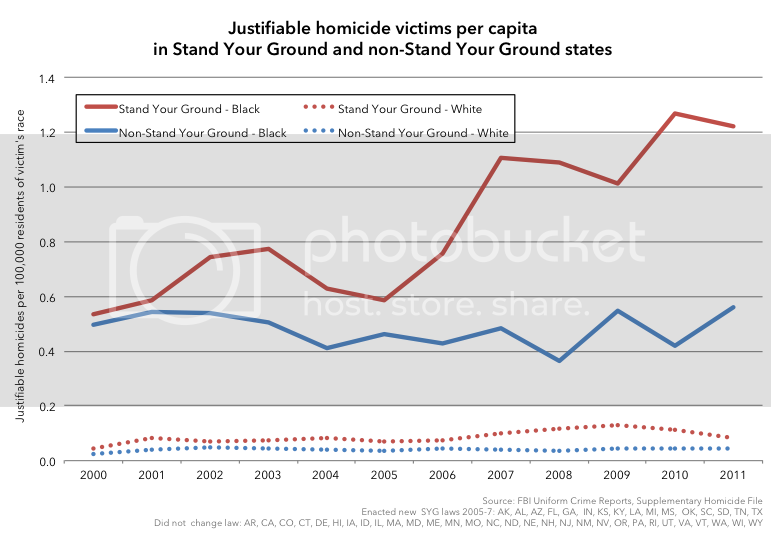 Among people shot to death in the black population in states with Stand Your Ground laws, the rate of those homicides found to be justifiable more than doubled between 2005 and 2011, while it fell in the rest of the country. In 2005, amid heavy lobbying by the National Rifle Association, Florida became the first state to pass a Stand Your Ground law. Since then, 21 other states have adopted similar laws. Ten of those states are in the South: Alabama, Georgia, Kentucky, Louisiana, Mississippi, North Carolina, South Carolina, Tennessee, Texas, and West Virginia. The others are Alaska, Arizona, Indiana, Kansas, Michigan, Montana, Nevada, New Hampshire, Oklahoma, Pennsylvania, and South Dakota. Since the Martin shooting, lawmakers in at least 11 states including Florida have introduced legislation to repeal or scale back their Stand Your Ground laws. Last June, Louisiana became the first state to pass reform legislation. Meanwhile, leaders in Florida have convened two task forces to assess how the laws affect public safety, and the U.S Commission on Civil Rights has launched a special investigation into the association between Stand Your Ground laws and racial bias. For more information on the Sept. 17 Senate Judiciary subcommittee hearing, click here. Among those scheduled to testify are Sybrina Fulton, Trayvon Martin's mother.